Uruguay's drug control chief, Julio Calzada, is a nervous man. As of Wednesday, he has just 120 days to deliver regulations controlling the world's first national marijuana market. The law awaiting the signature of President Jose Mujica after winning congressional approval Tuesday night describes what Calzada called an "experiment" in broad strokes. Now his ministry has to deliver the fine print to address the many unresolved questions raised in the Senate debate. The government's stated goal is to drive drug traffickers out of the dope business and gradually reduce consumption by creating a safe and transparent environment where the state can closely monitor every aspect of marijuana use, from seed to smoke. To be successful, this market must be kept small, contained and profitable. That means fixing just the right amount of active ingredient, THC, in seeds that can be cloned, identified and controlled. And with fewer than 200,000 habitual smokers in the country of 3.3 million, just 10 hectares of pot plants could supply the entire market. "I'll be nervous tomorrow," Calzada confessed to The Associated Press as he watched the debate from the Senate gallery. Uruguay's legalization of marijuana violates an international drug control convention and fails to consider a negative health impact, a body set up to monitor compliance with the five-decade-old treaty said on Wednesday. The president of the International Narcotics Control Board (INCB), Raymond Yans, said the change would not protect young people but would rather have the "perverse effect of encouraging early experimentation" and lowering the age of first use. Adding weight to the criticism of Tuesday's move by Uruguay — the first country to take such a step — the UN anti-drugs office said it agreed with the INCB and that states should work closely together to deal with the global drugs challenge. "It is unfortunate that, at a time when the world is engaged in an ongoing discussion on the world drug problem, Uruguay has acted ahead of the special session of the U.N. General Assembly planned for 2016," David Dadge, spokesman for the U.N. Office on Drugs and Crime (UNODC), said. Mujica acknowledged that his government isn't totally prepared for this plan, which poses a direct challenge to the global drug war, which an increasing number of national leaders and experts are calling an open failure. But he said the country has to try. "Einstein said that there's nothing more absurd than trying to change the results by always repeating the same formula. That's why we want to try other methods," he said in an interview published in Wednesday's La Republica newspaper. "We know we've started down a road where there's no university to tell us what to do. But we have to try, because there's no blind man worse than the one who doesn't want to see." Mujica, 78, has said he wants the market to officially open by mid-2014. Polls have showed two-thirds of Uruguayans are opposed to the plan. Many fear the government won't be able to control the market once it's legalized. Mujica, who says he never smoked pot and considers it a "plague," said he hopes they'll come around to his point of view. "We want to free future generations from this plague. This should be a national cause. We hope the people will understand and help." The law requires growers, sellers and users to be licensed and registered so that the government can enforce limits such as the 40 grams a month any adult will be able to buy at pharmacies, or the six marijuana plants license-holders can grow at home. 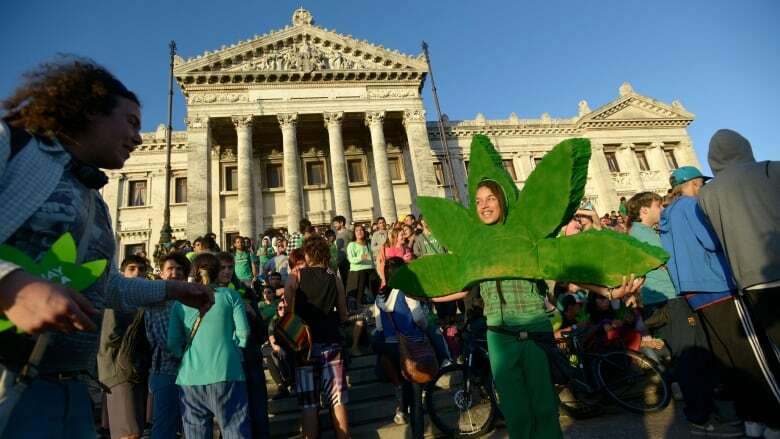 Uruguay was advised by marijuana legalization groups funded by billionaire currency speculator and philanthropist George Soros and his Open Society Foundation and Drug Policy Alliance. Mujica met with Soros and billionaire David Rockefeller, who also favors legalization, in New York in September to explain what he called his "experiment." "I would say to Mr. Soros, to Mr. Rockefeller, and to the president of the republic that you don't experiment with the Uruguayans. We are not guinea pigs," Colorado Party Sen. Pedro Bordaberry declared in the Senate debate. But Uruguay's plan is now a global test case, and what happens next will be closely examined as politicians elsewhere decide what to do. "Last year, Colorado and Washington; this year, Uruguay, and next year, Oregon and hopefully more states as well," said Ethan Nadelmann, executive director of the Drug Policy Alliance.